In clearing the woods this Spring for new walking paths, I figured we’d uncover a bounty of native wildflowers that had been blanketed by “years” of leaf decay – finally getting their day in the sun – so to speak. I haven’t been disappointed. 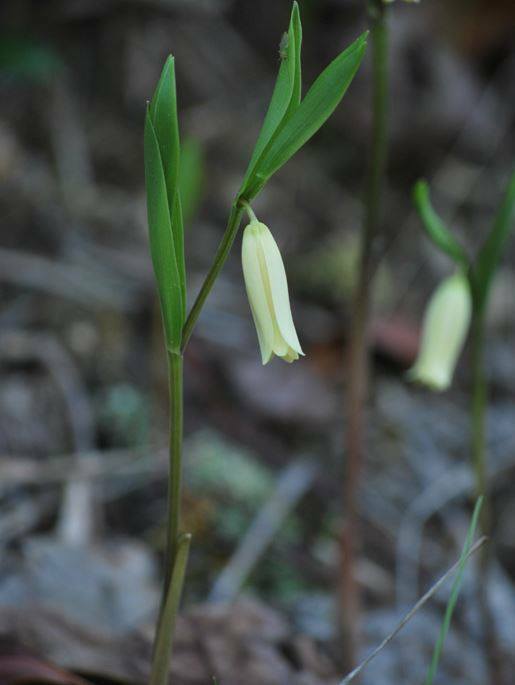 Say hello to Sessileleaf Bellwort, or Wild Oats – a member of the lily family. There are 6 types of bellworts in the States – 2 varieties are common to Georgia. The Sessileleaf Bellwort (which we have on the property), and the Uvularia Grandfloria Bellwort (also known as Merry Bells). A spreading variety useful and beautiful as a woodland ground cover. The plants typically grow 8 to 12″ with 2 single, yellow bell-shaped flowers per plant. I’ll be harvesting the fruit this summer and resowing several lowland patches along the path. Soil Description: Moist, rich, acidic soils. Prefers high humus and good drainage. Conditions Comments: Does not tolerate flooding.